Portland Public Schools Superintendent Guadalupe Guerrero has made a new pledge to get Tubman Middle School ready for opening in the fall of next year, reassuring leaders from the African American community. Instead of immediately looking for alternative sites as part of a school board directive to study environmental concerns of the school, located next to I-5 in the Eliot Neighborhood, the district now plans to spend more money on immediate physical upgrades to the school, taking some safety issues off the table and speeding up the time it takes to fully evaluate concerns. Any issue under study is not expected to stop the plans for opening the school in the fall, Guerrero said. The updated timeline came during a Thursday news conference he attended that was organized by education advocates from the black community, including Self Enhancement Inc. founder and director Tony Hopson, Albina Head Start Director Ronnie Herndon, Joe McFerrin of Portland Opportunities Industrialization Center, and Dr. Leroy Haynes of the Albina Ministerial Alliance. The leaders called Guerrero’s presence at the meeting “historic” and congratulated him for having the leadership and courage to attend the meeting in only his sixth week on the job. “In the past we have never had a press conference where both sides were at the table together,” Hopson said. Guerrero promised that he and the school board were “committed to opening Tubman” and that they’re “going to stay aggressive on this timeline” by not searching for a plan “b” and expediting air quality testing. Guerrero said that Portland Public Schools will make $11 million for renovations, including fixing roof leaks at the school and adding a new heating, ventilation, and air conditioning system. About $2 million dollars of that amount will upgrade Tubman’s foundational suitability for upgrades, immediately addressing concerns about a sloping hillside, officials said. However these promises do come with the contingency that unforeseen safety concerns, could still in the long run delay plans and mean the school would not be ready for opening in the fall. “We believe that we have the support of this superintendent headed in the right direction. But for those of us who have been on this train for a long time, we recognize that if we’re not vigilant, if we don’t hold folks accountable, things could change again,” Hopson said. Editor’s note: See the video below of the meeting with Guerrero and black educational leaders. November 16, 2017 press Conference discussing Tubman Middle School with Superintendent Guadalupe Guerrero, Ronnie Herndon of Albina Head Start, Joe McFerrin of Portland OIC, Dr. Leroy Haynes of Albina Ministerial Alliance, and Tony Hopson of Self Enhancement Inc. 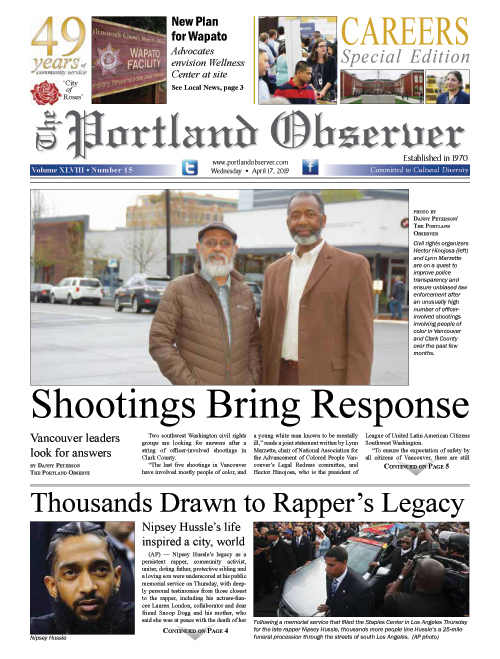 The conference took place at the Center for Self Enhancement in North Portland.